Should Parents Be Able To Sue For 'Wrongful Birth'? : Shots - Health News Several states are debating "wrongful birth" laws that would prevent parents from suing a doctor who fails to warn them about fetal problems. Critics say the laws give doctors the right to withhold information so women don't have abortions. Should Parents Be Able To Sue For 'Wrongful Birth'? 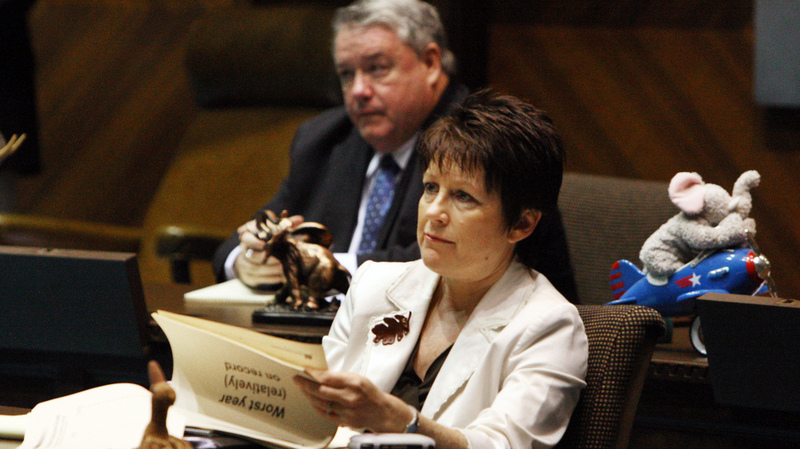 Arizona state Sen. Nancy Barto, R-Phoenix, listens during a special budget briefing at the state Capitol in October 2008. Barto sponsored a new law that prohibits wrongful birth lawsuits. She says the bill "sends the message that all life is worth protecting." Several states, including Kansas and New Jersey, are debating so-called "wrongful birth" laws that would prevent parents from suing a doctor who fails to warn them about fetal problems. Abortion rights activists say the laws give doctors the right to withhold information so women don't have abortions. In Suffern, N.Y., Sharon and Steven Hoffman's son, Jake, was born with Tay-Sachs, a genetic disease that mainly affects Jewish families and is usually fatal by age 4 or 5. "There's no treatment. There's no cure. There's nothing," Sharon says. She says her doctor did not test for the disease. At six months, Jake was diagnosed with it. The couple says he lost control of his muscles and had constant seizures. He died two years later before reaching his third birthday. Sharon says she would have had an abortion if she had known. "There is no quality of life," Sharon says. "The only thing that you would be bringing this child into the world to do is to suffer. And die." This couple sued their doctor for wrongful birth and settled for an undisclosed amount. In most states, parents can sue for negligence or if doctors fail to provide information about the condition of a fetus. But more than a half-dozen states have adopted laws that ban those lawsuits, and several others have been debating the idea this year. In Arizona, state Sen. Nancy Barto sponsored a new law that prohibits wrongful birth lawsuits. She says parents should not be allowed to claim that the life of a disabled child is worth less than the life of a healthy child. "It's a pro-life bill on every account, yes," Barto says. "It sends the message that all life is worth protecting, is worth living, whether you are born with a disability or not." The Arizona law does allow parents to sue for "intentional or grossly negligent acts," but bills in New Jersey and Kansas do not have that exception. Abortion rights activists say that means doctors could omit information about a pregnancy. "I believe it would allow them to lie about the results of an amniocentesis or simply opt out of even performing an amniocentesis that would normally be a part of standard care," says Kari Ann Rinker of the Kansas chapter of the National Organization for Women. It's important, Rinker says, for parents to get all the information from their doctors so that in these tough cases, families can prepare for a child with a disability or make decisions about whether to have an abortion. "No one wants to state out loud, 'I would have chosen to abort my child,' but this is often the only way for a parent to seek legal recourse," she says. But Kathy Ostrowski with Kansans for Life says the measure does not undermine parental rights or allow doctors to lie to patients. "The child has dignity. There shouldn't be a cause of action that this child shouldn't be alive ...," she says. "No way do we want doctors to be lying, and in no way does this say you can lie in this one area." These lawsuits are relatively rare, and they are often complicated. A Florida couple recently won a $4.5 million award because their son was born with just one limb. A jury agreed the doctor did not adequately screen for birth defects. An Oregon couple won a nearly $3 million judgment after their daughter was born with Down syndrome even though the mother had a prenatal test to detect it. Steven Hoffman watched his son struggle though his short life and says if lawmakers had firsthand experience, they might not find it so easy to pass these laws. "My heart is broken, and it is broken for the rest of my life," he says. "And it's something no parent should have to go through." Attorneys and parents who have sued for wrongful birth say states shouldn't turn medical malpractice cases into a fight over abortion.